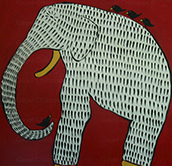 Gayel uses paint to express her feelings as one would use words for writing poetry. Favorite subjects are landscapes, the figure and still life. Choosing acrylic, watercolor, mixed media and print-making as painting mediums. Her recipe to expressing herself is this: many cups of color, dash of design, and a handful of whimsy, all tossed together. Childress gives credit to her art success from living in Ojai by saying, "The Ojai Valley brings the magic out of all artistic souls that live here." Gayel welcomes visitors to her studio. Many of these artworks are available as art prints, directly from Gayel. Return back to this site to view more of Gayel's artworks, which will be uploaded in the future.